Even more cards to play along with Taylor's anniversary celebration. 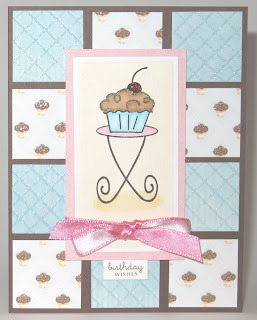 Both of today's cards used the Basic Grey Cupcake 6x6 paper pad. 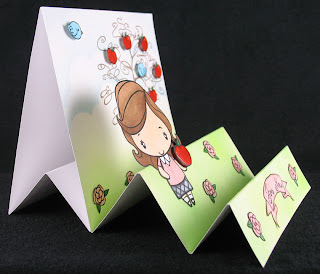 The first card used Jackie Pedro's sketch. 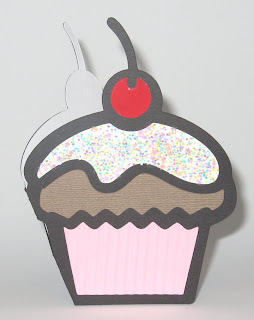 I was kind of stumped at first with the partial circle, but once I tried this cupcake from Kitchen Sink Stamps' Happy Birthday Cupcake set, it made sense! Luckily the sentiment from the same set also fit very nicely into the sketch! 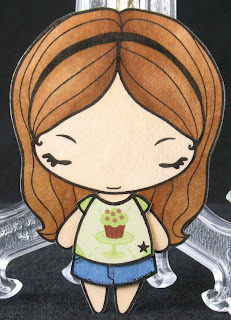 Little notes: the cupcake was paper pieced onto 2 different Cupcake patterns, and then I used 2 more for the background strips. 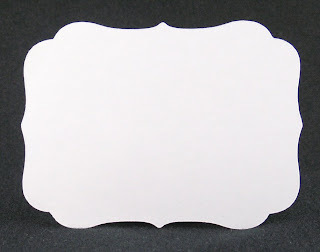 The scalloped circle even uses a piece from the same pad. I love that there are even solid papers in the pad - makes coordinating so easy! 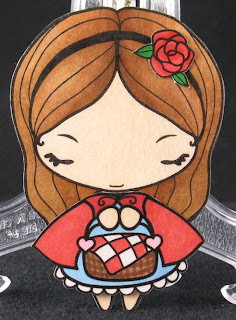 I did a little bit of airbrushing on the circle, the sentiment oval, and the base card to sort of match the distressed coloring on the sprinkle paper. The little dots on the top are from Stamping Bella and I used the Stampin' Up! small oval punch for the sentiment. 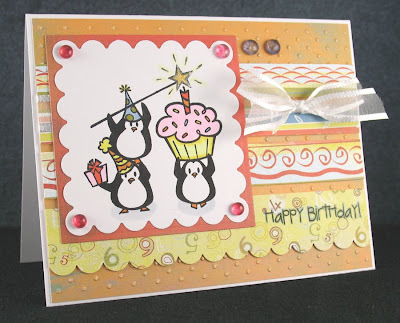 This second card used Vicki Chrisman's sketch. Another fun sketch! Both the super cute main image and the sentiment are from the Smells Like Cake set from The Cat's Pajamas. To make sure the sentiment stood out on the busy background paper, I used my Stamp-A-Ma-Jig to stamp the sentiment a few times (to make sure it was really nice and dark) and then went over all the lines with the same blue Copic that I used for the main image. A little Copic tip: I like to match my Copics to the colors in the papers I'm using. Since I'll use a paper pad for a number of projects, I'll write down all the Copics I matched on a sticky note and stick it to the paper pad. That way, the next time I use the paper pad, I don't have to get out my color chart and re-match all my colors. Thanks for visiting today. That's 7 cards down, 2 to go for the challenge!! More cards to play along with Taylor's anniversary celebration. Keeping with yesterday's trend of using the DCWV Sweet Stack, I have another SS card. I used Stephanie Hargis' sketch for this one. This card was super duper easy because there was a sheet of PP that had all 3 of these patterns on it! I simply cut the different patterns into strips and reassembled them back onto my card. The Dark Chocolate ink and cardstock, as well as the sentiment and swirly star images are from Papertrey Ink. 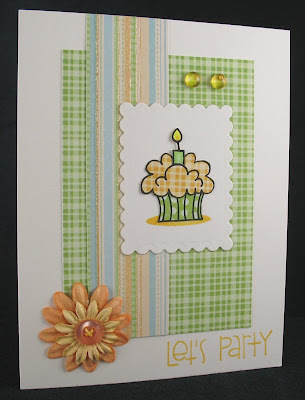 The next 2 cards were both made with the Basic Grey Two Scoops collection (I so love this color palette!). This first one used Monika Davis' sketch. I had a hard time with the sketch, but I'm still pretty happy with the resulting card! 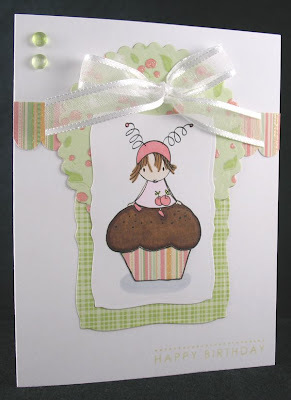 The Rosebud Cupcake image is from Lockhart Stamp Company, and the sentiment is from Papertrey Ink. 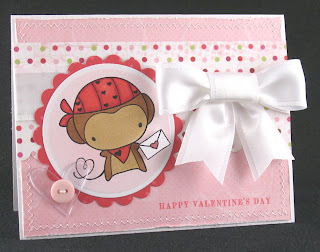 And the last card for today used Sherrie Siemens' sketch. I really had a lot of fun with this sketch. Although I do a ton of machine stitching on my cards, this is the first time I've done hand stitching! 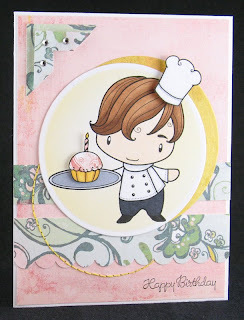 This is also my first card using the Happy Chef set from The Greeting Farm. He's so cute and has a bunch of different stuff that he can carry on his platter, including this cute cupcake (I used the candle from the cake that's also in the set). Thanks for looking and I hope you'll stop by again for Part 3! Taylor VanBruggen is celebrating a year of cupcake challenges on her blog, and I decided to try *really* hard to play along! I'm hoping that by forcing myself to stamp a ton, my mojo will return! This first card is based on Taylor's sketch. You can see I flipped it sideways and changed the buttons a bit (moved one and deleted the other one). The focal image is not stamped - it was just cut out from a piece of patterned paper. 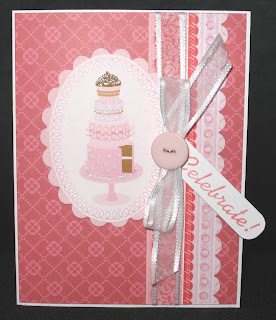 All PP is from the DCWV Sweet Stack, except the pink scalloped oval layer which is Scenic Route. 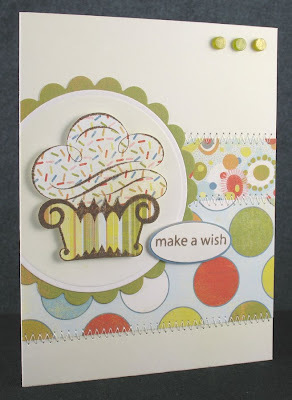 The only stamping on this whole card is the sentiment, which is from the Inkadinkado Birthday Cupcake set. 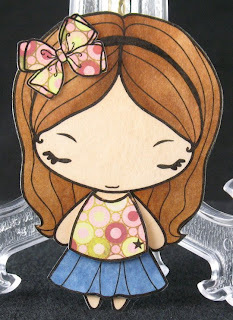 I did another "sort-of-faux bow" for todays card. I just looped a long piece of ribbon with the ends sticking out on either side, then tied the button around the middle to cinch it all up and hold it together. I did this because I didn't want to stick the button over the knot - too much bulk. This keeps the whole thing just a little flatter. My second card for today used Donna Baker's sketch. I really loved her use of all those little squares, but I decided to keep mine simple and only use 2 different patterns, both from the Sweet Stack (I just can't get enough of that stack!). 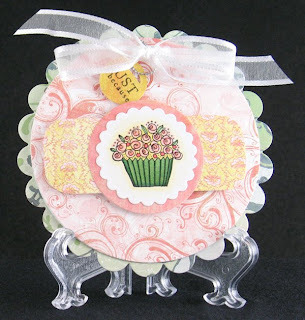 The cupcake image is from a Studio G dollar set, the stand is from the MFT set Window Shopping, and the sentiment is from Papertrey Ink's Mixed Messages set (one of my very fave sentiment sets!). Thanks for visiting and I hope you'll be back to check out the rest of my challenge cards. I'm going to try to do all 9 and actually use cupcakes for them all! We'll see if I can do it! It's been a long time since I've participated in the AmyR sketch challenges so I'm really glad I finally got this one done! I really adored the monkeys from The Greeting Farm's Best Mates set, so I was thrilled when Marie included this monkey in the Sweet Deal set. 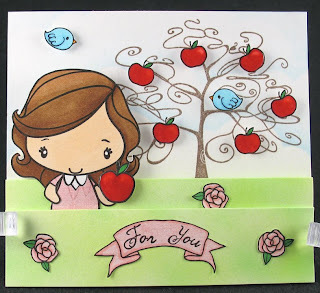 I gave him a little love letter to hold from the Wishing Tree set and added the sentiment from Papertrey Ink's Sweet Love set. I stamped and colored the monkey with Copics, then masked him to do the pink airbrushing, leaving the Nestability in place for that neat white edge. The patterned paper is from the Scenic Route Loveland collection, the ribbon is May Arts, the ghost heart is Heidi Swapp, and the button is Daisy D's. A little note: the bow is a bunch of little pieces put together to make a bow. Since this ribbon is so wide, I find it a little difficult to make a really nice little tied bow. I took a big loop and then taped a tiny bit around the middle, then added two bits of tail underneath. I think it looks much neater than any bow that size that I could have tied. Looking at the finished card, I do think the giant bow is too much, but I'm still trying to find my mojo, so I guess it's not that bad! TFL!! The best part is that I did it all in the same selection box and used the nudge tool so that it can be easily sized however I want (you have to understand DS to get that). 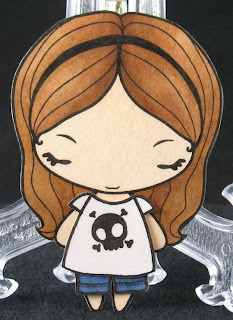 I have to admit that I'll probably still buy the Nesties (I really love the embossing effect and also airbrushing with the die in place), but at least this gives me more options! The label is sort of fancy so I immediately thought of Pretty Hat Anya to go with it. All the patterned paper is Wild Asparagus. I've been hoarding this pretty floral paper forever and thought it also went perfectly with Pretty Hat Anya. 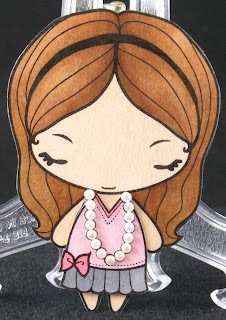 The image is colored with Copics and the pearls are puffy pearl paint. A few details: there is a real little button sewn onto her hat, I stitched over the X on her hat too, and popped up the hat just in the middle for some dimension. Lastly, I used dimensional adhesive on her shoes to look like patent leather. I hope you like the label and the card! TFL! I cut the image at 2 3/4". 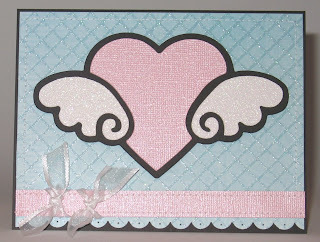 I used the DCWV Glitter Cardstock for the wings, The Sweet Stack for the background, and some Bazzill Bling for the heart. I was a little disappointed with the Bling cardstock. I thought it would be glittery, but it's got more of a pearl sheen. Still pretty, but I think it's a little too subtle for something called "bling." I did the scalloped bottom with the Stampin' Up! punch, and then pierced through each scallop. There's some simple straight stitching, and the ribbon is May Arts. Hope you like it! I got an award from the super sweet Enjoli over at Stamping Under the Sun. I'm supposed to name 5 things I'm addicted to. Here are the first five I thought of (I've got a very obsessive personality so it's pretty hard to name just 5!). Thanks so much Enjoli - you made my day!! 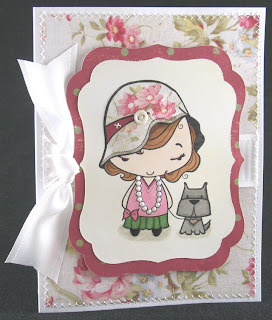 The latest contest on the Splendid Stamping with the Greeting Farm blog is an Anya Fashion Show. Of course I had to enter!! 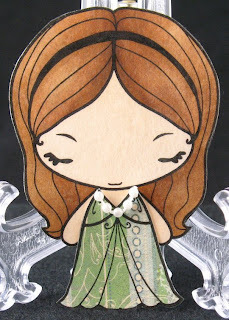 As soon as Maria announced her plans for Anya paper doll stamps I've had an idea for a paper doll set bouncing around in my head. Luckily my stamps came in plenty of time for this contest. I printed out the Club Anya logo twice and punched it with a Stampin' Up! punch for the front of the armoire. It was just too stark white and plain otherwise. 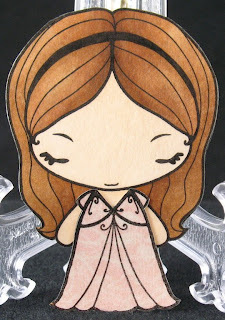 Some details: all the pieces, including the Anya doll, were stamped, colored (if they weren't paper pieced), and then covered with clear laminating film and cut out. The doll was also mounted on thin magnet sheet so she can be stuck on the 'fridge or wherever, and it's also what holds her in the armoire (there's a thin piece of metal behind the middle panel). After creating the armoire outside, I created the inside by laminating 3 pieces of cardstock and sticking them inside the armoire. All of the clothing pieces have double-stick tape on their backs to stick to the doll and the armoire. All the little pearls and the rhinestone were stuck onto the laminating film because they just wouldn't look good if I tried to stick the film over them. (notice that Anya can also fit into Ian's shirts - isn't a girl's fave t-shirt always the one she stole from her boyfriend?). 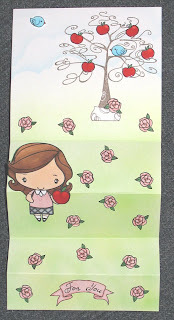 the outfit from the Ridinghood Anya digi stamp, and the rose from the Wishing Tree set. I LOVE the versatility of the clothing pieces!! I cut the sleeves off the t-shirts to make tank tops, and the top off the short dress to make a long skirt. Then I masked off the long evening dress and stamped it with a t-shirt image to give the dress little sleeves. 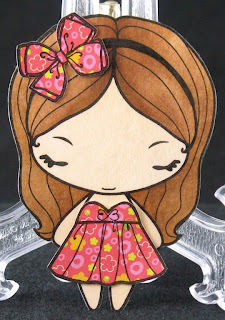 And here are a couple more - it's so much fun to paper piece all the little outfits! And also to try and find little accents, like this itty bitty string of pearls! 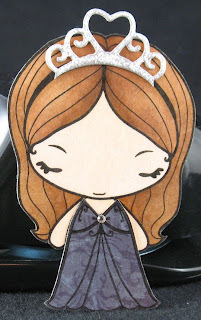 But my fave outfit has got to be this long evening gown with diamond (rhinestone) accent and sparkly tiara! The tiara is a very old 2-part Quickutz die. Isn't it adorable on her?! 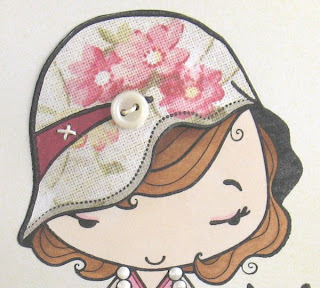 I have a lot more playing to do with these stamps, so you will probably see more dress up from me in the future! 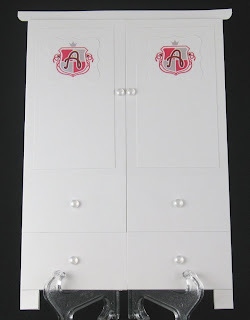 And I've left plenty of room in the armoire to fit a bunch more outfits, especially since Marie has mentioned that she will be designing more clothes for them in the future. Hope you like my little project and TFL!! 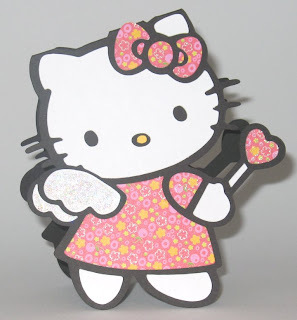 I'm still loving the Hello Kitty cartridges so I have a few more projects to share today. The first two aren't actually HK images, but they are on the cartridges and I liked the look of them too! 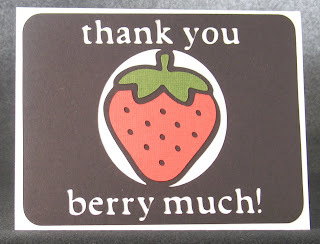 The strawberry is from the HK Greetings cartridge, the frame is from Fabulous Finds, and the font is Plantin Schoolbook. This cupcake is also from the Greetings cartridge. It was super easy because the cartridge already has the card design built in so I didn't even have to design it myself. I embellished it a bit by crimping the liner, adding some glossy glue to the cherry, and some chunky glitter to the frosting. I also added a white liner so I could write in it with a regular pen. This HK is from the Font cartridge and because it doesn't have a card function, I had to design it with the Design Studio software. I did the fold at the top of her head so a little of the bow got cut off, but once I added the patterned paper, I barely noticed it. I added some Stickles to her wings and did a bunch of tracing of the designs on the PP with a Stardust glitter pen for a more subtle sparkle. The patterned paper is from the K&Co. Berry Sweet paper pad. And now for the blog candy part of the post: the DoodleFactory has a bunch of brand new stamps just in time for Valentine's Day cards and they're giving away a whole set. Check it out here. Aren't they adorable!?! Did you hear/see the news that Pink Poison is now officially called The Greeting Farm? Such a cute name and logo! I've changed all the tags on the Pink Poison cards to The Greeting Farm so they will all come up together when you click on that category. Anyway, I made a card a while ago that I sent to Marie and forgot to post it here. It was my first attempt at a Stair Step card and I had a LOT of fun with it!! I will definitely have to do it again in the future! Here's the card just sitting on the table. It tends to unfold itself just a bit, making it sit on its own really nicely. I modified the dimensions that were given on Splitcoast so that I would have that nice big panel at the back to stamp the Wishing Tree on. Then I also had to add another piece to hold up the last panel. You can see the added piece on the side view below (last picture). 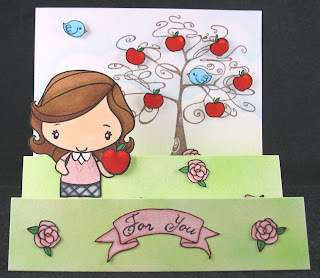 All the apples, birds, and roses are from the Wishing Tree set (it's got a ton of little images that make this a very versatile set!). This picture shows the card extended. You can see all the extra little roses that I added in the folds to fill the space. 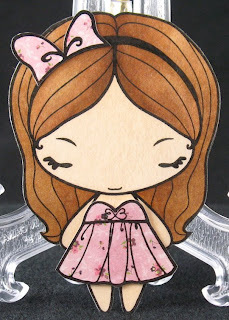 All of them were stamped on white cardstock and pink patterned paper. I colored both versions with Copics and cut out just the flower portion of the PP versions, and the whole image of the white cardstock versions. Then I mounted the PP flowers onto the cardstock bases. [It's been a while so this is how I think I did them.] It wasn't as much work as it sounds - the shape is pretty simple and the image isn't too small to hold onto. 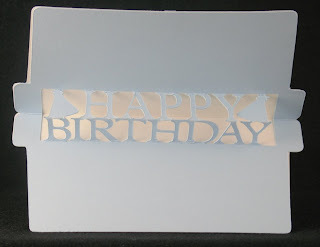 This is how the card looks fully closed up (I had to use those clear clothes pins to keep it shut). I tried to position all the elements, especially the Teacher Anya so that the card would look good in every orientation. And here's the side view where you can see that extra piece on the back that I talked about earlier. You can also see that I popped up the birds and all the apples on the tree, as well as the one that Anya is holding. A couple final notes - the sky was sponged with a cloud stencil and blue ink, and the grass was done with the Copic airbrush system and a few different shades of green Copics. The "For You" banner is from the Lucky Bunnies set. TFL! 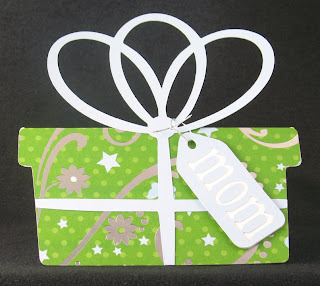 I used the Celebrations cartridge for the present, bow, and tag, and then the "mom" was done with Plantin Schoolbook. 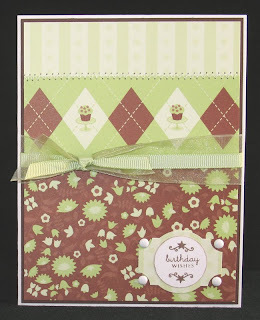 The patterned paper is from the DCWV Blossoms and Butterflies paper pad. If I use this pop-up file again, I'll definitely use a lighter weight cardstock. I used Stampin' Up! for this one and it was way too thick. It was hard to score and fold without tearing and then it squashed up funny and had a lot of creases. But I still like the way it came out and hope my mom likes it too!